1. Put the spinach in a large colander set over the sink. Carefully pour a kettle of just-boiled water over to wilt. Refresh under cold water, then squeeze out the excess water. Take a small handful and finely chop; set aside. Place the rest of the wilted spinach in a saucepan with 10g butter; set aside. 2. For the hollandaise, melt the remaining 100g butter in a small pan. Put the lemon juice and 2 tsp vinegar in a small, heatproof bowl, add the egg yolks and whisk with a balloon whisk until light and frothy. Place the bowl over a pan of simmering water and whisk until the mixture thickens slightly. Gradually add the melted butter in a thin stream, whisking constantly and pausing the addition of butter every so often, until a glossy sauce forms. It should be spoonable – if it becomes too thick, whisk in 1 tbsp water. Season, stir in the handful of finely chopped spinach and keep warm (off the heat). 3. To poach the eggs, bring a large, shallow pan of water to the boil and add the remaining 2 tsp vinegar. Lower the heat to a gentle simmer. One by one, crack the eggs into a teacup and gently slide into the water. Cook for 4 minutes, then remove with a slotted spoon to a plate lined with kitchen paper. Warm the pan of wilted spinach and butter through with the nutmeg; season. Toast the halved muffins and top with the buttery spinach and smoked salmon. 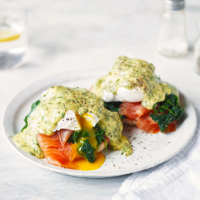 Add an egg to each and cloak with the spinach hollandaise. Season with black pepper and serve.